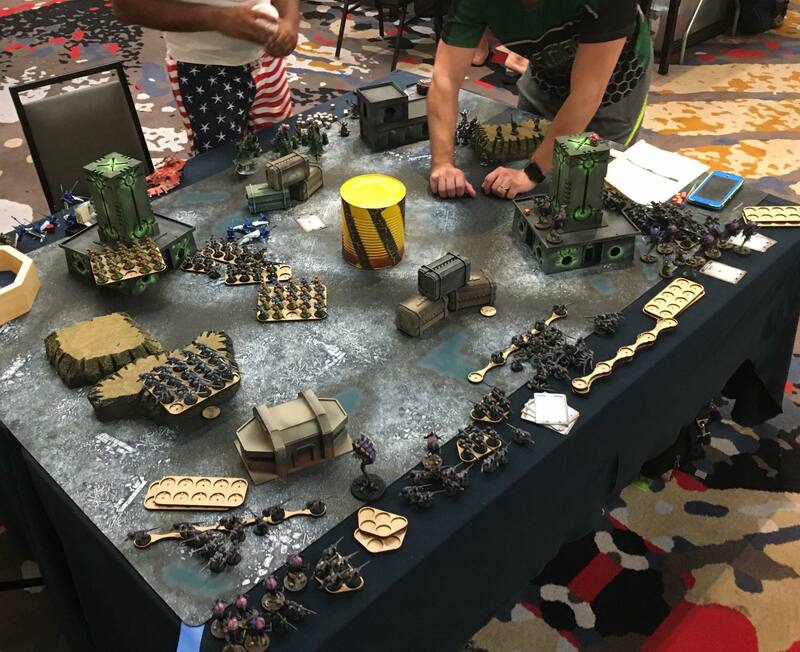 Let take a gander at the amazing, and HUGE, 257-model Nid Swarm that took 2nd Place at Wargames Con. 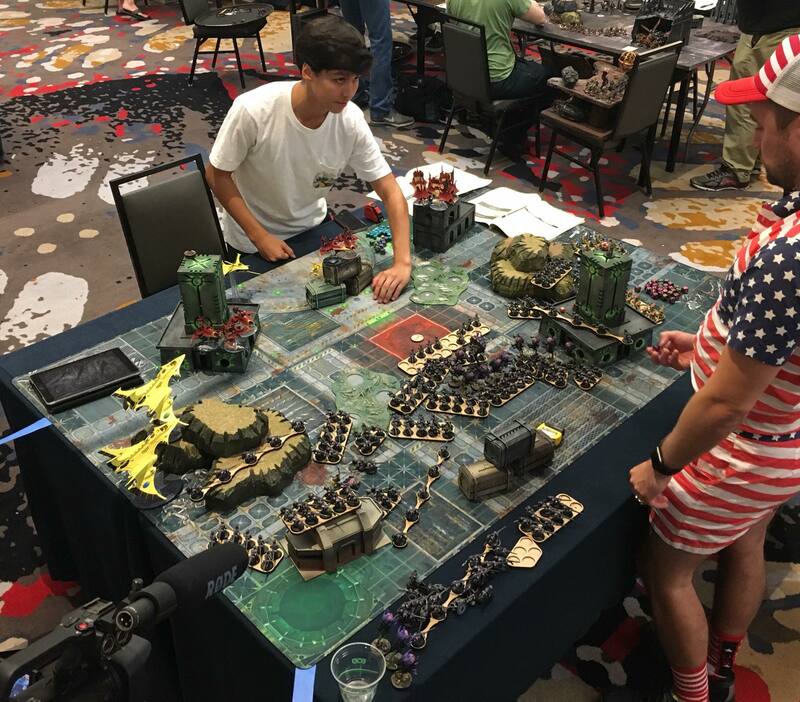 This weekend here in Austin, TX, we played host to Wargames Con X. This amazing event saw a host of players bringing there best in a number of game systems. Over several days we bore witness to to a number of awesome games and saw some great lists in action. 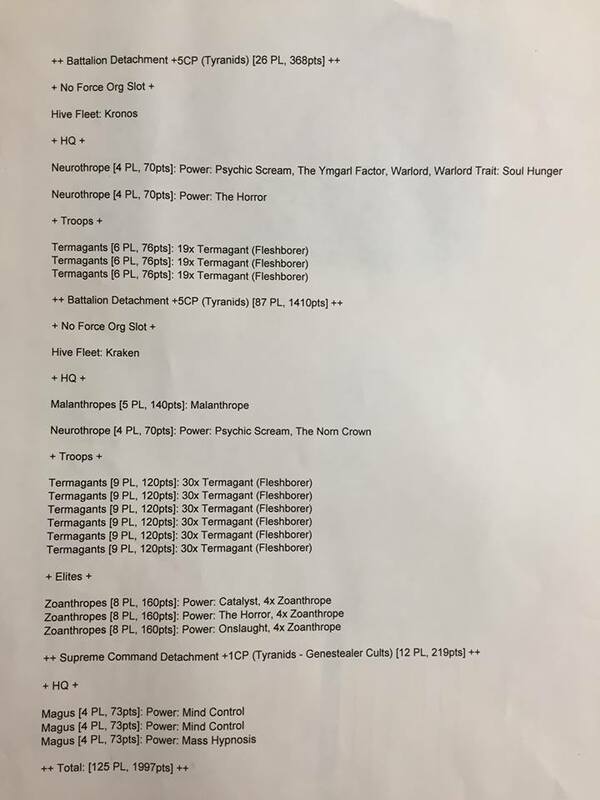 We’ve already taken a look at the list that won the event, which is a very technically competent Ynnari list, but one with no surprises. 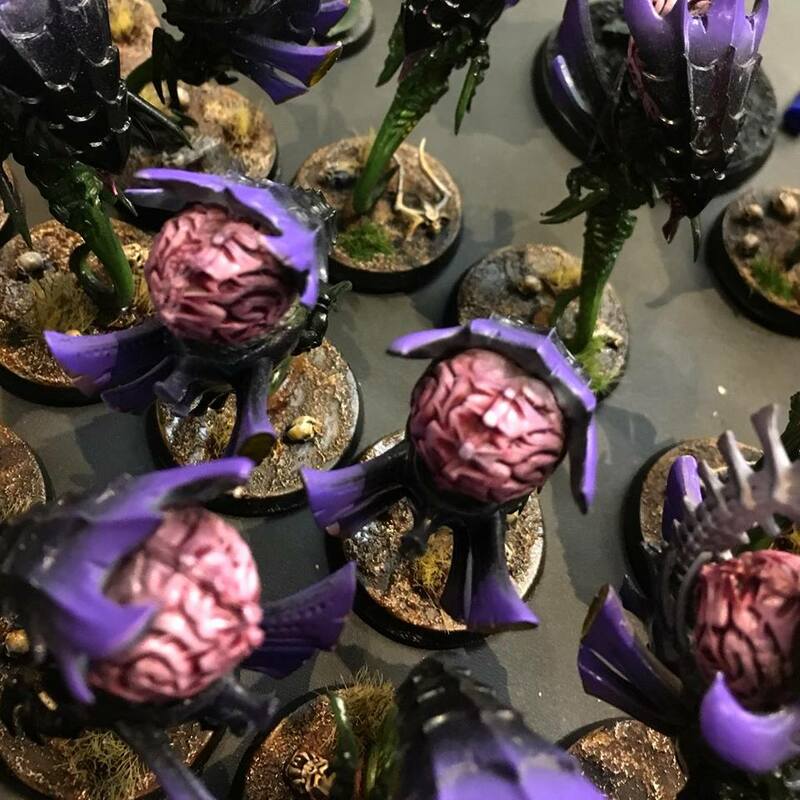 Today I want to take a look at the list that took 2nd place, and one of my favorite lists from the events, Clifton Russell’s massive and awesome UBER-Nid Horde. As you can see thats 237 Termagants. 14, Zoanthropes, 3 Neurothropes, A Malanthrope and 3 Magus, for a total of 257 models. That’s enough to make most Ork hordes turn green(er) with envy! This is a massive massive army, that looks amazing on the table. Cliffton runs the vast majority of his units on movement trays and is super quick and efficient about moving and shooting his units. Both his games I saw finished 6 turns with time to spare, and I believe he finished all 6 turns in his other games as well. Way to go Clifton! Clifton looking over his 257 purple children. While massive this list has a couple of things it does well. The most obvious aspect of the list of the Termagants. While individually not super deadly, in these mass numbers they can cause a lot of a harm. Sheer numbers can make up for a lot. More than that however they give him an unparalleled level of board control. In his games he was constantly forcing the opponents back into corners and controlling where they could move. 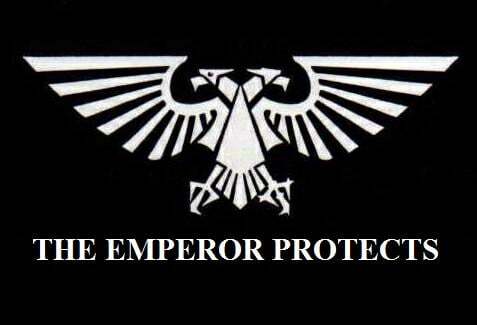 This also makes the list very good at controlling objectives. You can check out his scores here and what stands out is how well he did on secondary objectives. (each mission had 30 points your could get from a primary objective, 30 from secondary scored each turn, and up to 3 bonus points). This is thanks to his UBER-Horde’s ability to grab and hold objectives. The heavy hitters in this list are his mass of assorted Thropes. This large mass helps Clifton dominate the psychic phase. He ran rain smites and other attacks on his enemies, while also buffing his own troops. Overall these are a bunch of tough mutually supporting units that with 3++ saves are hard to take down. Even with the smite nerf there is still a lot of power behind a massed smiting. By being Synapse they also make you have to actually kill those massive horde of Gaunts down to the last model. 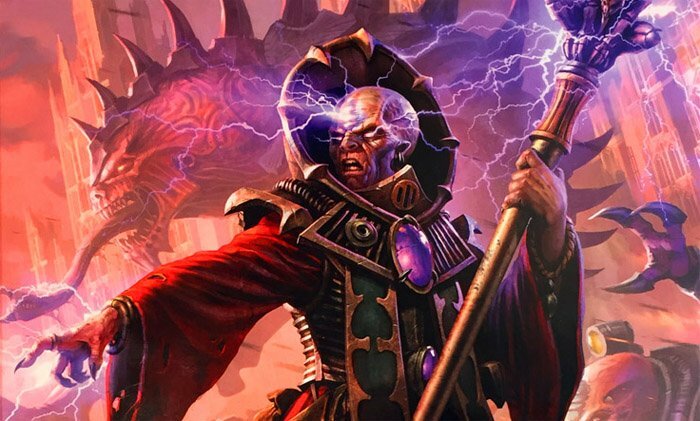 The real dirty trick in this list is supreme command detachment full of Genestealer Cult Magi. The Magus is a unit that not many people know well. Genestealer Cult in general doesn’t see a lot of play so part of the this model’s success is surprise. The other is Mind Control. Mind Control is possibly the best power in the game right now. It allows you to target a single enemy model, roll 3d6 and if that number is equal or higher than the models leadership, you can either make a CC attack or shoot with the model. With only a 6 to cast this is a spell that on average goes off, and at worst vs LD 10 on average works. Its a very easy spell to make work. Combine this with Genestealer cult Ambush allowing the Magus to pop up almost anywhere it wants and it you can effect almost any model you’d like with this. This is particularity effective in the current meta which has pushed a lot of smaller model count armies with powerful models. You can, for instance, take control of a Knight and have it lay into its allies. This super potent tactic helps the list deal with tough models that might otherwise have given it issues. So there you have the list. Despite losing one game, vs Nick Nanavati, and drawing the primary in his 3rd game, Cliffton and his list still took 2nd. This is a much more innovative list than others we’ve seen, and one of only 3 Nid lists at the event. While the Big FAQ 1 may not have shut down Ynnari, it does seem to have killed Nids overall. It was also a fun list to watch played and I look forward to seeing more like it in the future. Everyone give it up for Clifton, for bringing a great creative list and playing it like a champ! Let us know what you think of the list, and how you’d deal with it, down in the comments!